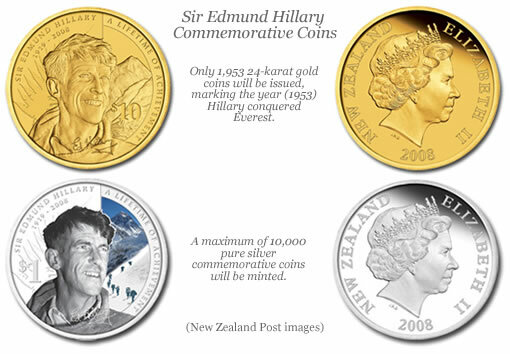 New Zealand has issued commemorative silver and gold proof coins honoring the life achievements of Sir Edmund Hillary. The release of the proof coins mark the 55th anniversary of Hillary’s adventurous climb of Mount Everest with Sherpa Tenzing Norgay on May 29, 1953. The two were the first climbers to conquer Everest. While he shot to International fame following his Everest accomplishment, he is equally renowned for his subsequent achievements in mountaineering and Antarctic expeditions, his devotion to the Nepalese people through his founding of the Himalayan Trust and his support of the great outdoors. Only 1,953 24-karat gold coins will be issued by the New Zealand Post. That number marks the year (1953) Hillary and Norgay conquered Everest. The coin has a face value of $10 NZD and is priced at $520 NZD. It is 0.999% pure gold proof, weighing one-quarter ounce. Each coin bears the inscription, ‘A Lifetime of Achievement’, and depicts Sir Edmund against a backdrop of the world’s highest peak, Mount Everest. Both coins have an obverse portrait of Her Majesty Queen Elizabeth II by Ian Rank-Broadley, of England. “To many Western eyes, the Everest region is a place of great beauty and high mountains to be conquered. For the Sherpas who live there, however, life has few privileges. Medicine and Education are scarce, bridges and path are often destroyed, and the forest upon which they depend are rapidly depleting. "In some ways I believe I epitomize the average New Zealander: I have modest abilities, I combine these with a good deal of determination, and I rather like to succeed." Once, while resting on a rock during a short trek in Nepal with friend and film director Michael Dillon, an American walker stopped and showed Hillary how to hold an ice-axe. “Hillary listened and thanked him, but said nothing else,” remembers Dillon. “The American went away without any idea whom he had spoken to.” The first man to stand on top of the world didn’t see himself as a hero. Others always will. A remarkable man he was. I live in the U.S. and was interested in purchasing several of the coins. Should I contact the New Zealand Post.